FAO and the DANIDA Forest Seed Centre have cooperated closely over the past two decades in the field of tree improvement and seed procurement. A representative of the Seed Centre has been a member of the FAO Panel of Experts on Forest Gene Resources since it was established in the sixties, while a representative of FAO's Forestry Department is a member of the Project Committee of the Seed Centre. This has ensured a high level of integration between the programmes of the two organizations. A particularly fruitful example of cooperation has been the series of training courses on tree improvement, seed handling and afforestation, jointly sponsored by FAO and DANIDA, and held successively in Denmark, Kenya, Thailand, Nigeria and Venezuela. Currently the Seed Centre is providing storage facilities for seed collected through FAO's project on Genetic Resources of Arid and Semi-arid Zone Arboreal Species for the Improvement of Rural Living. The present publication is a further example of this cooperation. It gathers together information from a number of sources, including the FAO/DANIDA training courses mentioned above, Working Papers from FAO field projects, as well as technical leaflets and notes compiled by the Seed Centre. A draft edition of the Guide was published in 1983 in a limited number of copies, which were distributed for comments. The present edition has been revised in the light of comments from readers and illustrations have been added. The increased rates of tree planting, which is apparent in so many countries today, emphasizes more than ever before the need for good seed. Seed quality has a critical effect on the quality of the trees established and on the economics of planting them. This is equally true whether planting is in large-scale commercial plantations or in small-scale diffuse farm woodlots or as scattered single trees. Seed quality comprises both the physiological viability and vigour of the seeds and their genetic quality - their ability to produce healthy offspring which are well suited both to the sites where they are planted and for the products or services which they are intended to provide. 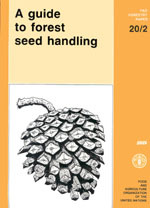 This Guide is concerned with the physiological quality of seeds and it is hoped that it will be useful especially to developing countries in the tropics, where publications on forest seed handling are few in comparison with those for the temperate zones. The guide was compiled by R.L. Willan, consultant. The following specialists kindly submitted valuable, written comments on earlier drafts: H. Barner, F.T. Bonner, A.G. Gordon, S.K. Kamra, F. Ng, P.G. Pattanath, M. Robbins, M. Simak, B. Suszka, J.W. Turnbull and B. Wang. Illustrations have been provided from a wide variety of sources; many have appeared in earlier publications. FAO and DANIDA are grateful to all who generously gave illustrative material and permission to reproduce it. The source of each illustration is shown in the individual credit lines. The line drawing on the cover is by M. Robbins. Facilities and help given by all staff at the DANIDA Forest Seed Centre and by library staff at the Commonwealth Forestry Institute in Oxford are acknowledged with thanks. Estimating full seed content by cutting test. Appendix 2 Considerations in the design and equipment of long-term seed-storage facilities for genetic conservation (orthodox species). Appendix 3 Long-term seed-storage facilities of the regional genetic resources project at Turrialba, Costa Rica. Construction details. Appendix 4 The use of deep-freeze chests for longterm storage of small seed collections. Appendix 6 Annotated list of equipment which may be needed for collection of seed, site information and herbarium specimens. 1.1 Estimated total areas of forest plantations in Tropical Africa, Tropical America and Tropical Asia 1975–1985. 1.2 Estimated annual planting rates. Brazil, India and Tropical Africa. 1.3 Effect of species choice on quantity of seed required per unit area. 2.1 Longitudinal section through a typical pistil just before fertilization. 2.2 Longitudinal sections through ripe seeds of Paulownia tomentosa and Tectona grandis. 2.3 Examples of different types of fruits. 2.4 Longitudinal section through an ovule of Pinus during the period of pollen tube development preceding fertilization. 2.5 Examples of germination in two West African Sterculiaceae. Epigeal in Mansonia altissima and hypogeal in Cola nitida. 3.1 Provenance Regions for Pinus caribaea and P. oocarpa in Honduras. 3.2 Cone crops of Douglas-fir, Vancouver Forest District, 1935–1974. 3.3 Example of a cone-cutter for seed crop estimation on a longitudinal section. 3.4 Seed content is estimated by counting good seeds on one surface of each of several sliced cones. 4.1 The Advanced Line Technique. 4.2 The Schaumann Tree Shaker. 4.3 Funnel for trapping Acacia aneura seed. 4.5 Use of vacuum seed harvester for acorns. 4.6 A selection of Acacia seed collecting equipment. 4.7 Saws, pruners, rakes and other hand tools for harvesting tree fruits. 4.8 The High Limb flexible chain saw. 4.10 Two strut sectional ladder. 4.12 Tree bicycle, tree gripper or baumvelo. 4.13 Tree bicycle in use. 4.14 Hand picking Larix cones. Tree bicycle. 4.15 Use of hand tools and safety line in picking fruits in the crown. 4.16 Climber controlling own descent by safety line locking method. 4.17 Use of extension platform for cone picking. 5.1 Interim cone storage racks. 5.2 Wire baskets used for temporary storage of cones. 5.3 Temporary cone storage in boxes. 5.4 Temporary frame for field drying eucalypt capsules. 6.1 Precuring sheds with open-air racks. 6.2 Top view of the Dybvig separator. 6.3 Solar drying of pine cones under clear polythene roofing. 6.4 Solar cone drying of Pinus kesiya and Pinus merkusii in rotatable drums. 6.5 Solar drying of pine cones. 6.6 Kiln seasoning. Stacked trays entering a kiln. 6.7 Interior view of a kiln with trays. 6.12 The Resilient Tapered Thresher. 6.13 CSIRO 15-cm Flailing Thresher. 6.14 Cement mixer used for dewinging. 6.15 Missoula dewinger for small seedlots. 6.16 Liriodendron tulipifera before and after dewinging. 6.17 Electrically operated laboratory seed blowers. 6.18 Locally made seed cleaner. 6.21 Equilibrium moisture content of wheat seed, showing separate curves for desorption and absorption. 6.22 Moisture content percentages of fresh seed of Pinus palustris in equilibrium with air at various temperatures and relative humidities. 6.23 Equilibrium moisture contents for 3 orthodox species. 6.24 Equilibrium moisture contents for 4 recalcitrant species. 7.1 Airtight containers used for storing seed. 7.2 Interior view of cold storage room. 7.3 Examples of different types of container used for storage or shipment. 8.1 Effect of several presowing treatments on germination of black locust. 8.2 Benefits of cold stratification for speeding germination of loblolly pine. 8.3 The effect of various pretreatments on germination of Pinus elliottii. 8.4 The effect of pretreatment on germination of Acacia mangium. 8.5 A rinsing trough for washing acid from treated seeds. 8.6 One apparatus for treating large lots of seed with acid. 8.7 Outdoor stratification of Juglans nigra in sand. 8.8 Desired arrangement for stratification in a large barrel. 8.9 Loblolly pine seed prepared for stratification in a plastic bag. 8.10 Effects of several treatments to overcome double dormancy in eastern redbud. 8.11 The US Forest Service recommendation for preparing repellent and applying it to seed of Pinus elliottii. 8.12 Flow-scheme for the removal of mechanically damaged and filled-dead seeds according to PREVAC- and IDS- methods. 8.13 The germinating seeds of IDS/PREVAC-treated Pinus caribaea and P. oocarpa. 9.4 Seed dividers (a) Boerner (b) Gamet. 9.5 An opaque glass screen for purity tests and determinations of the number of seeds per kg. 9.6 Two types of weighing scales used in seed laboratories. 9.7 Counting board with seeds of Celtis laevigata. 9.8 Counting head on a vacuum seed counter. 9.9 Open seed germination cabinet and group of cabinets. 9.10 Conviron G 30 germinator. 9.11 Clear and black germination boxes developed for seed testing. 9.12 Copenhagen tank and rolled filter paper for germination tests. 9.13 Acorns of Quercus alba germinating on Kimpak. 9.14 Germination of Douglas-fir and lodgepole pine seeds. 9.15 X-ray radiograph of teak fruits showing the variation in the number of locules. 9.16 X-ray radiographs showing embryo and endosperm classes in coniferous seeds. 9.17 X-ray radiograph of Pinus caribaea seed. 9.18 Quercus seeds cut in halves for oven drying in moisture determination. 9.19 Dole electric seed moisture meter.